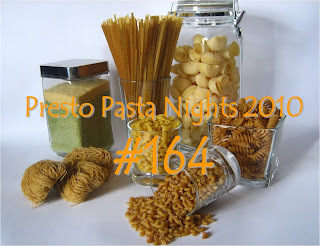 Poor Susan, The Well Seasoned Cook and our Presto Pasta Night #164 host has done a heroic job, given that she's had dental surgery - Yikes! But trooper that she is, the roundup is ready for viewing and she'll add commentary soon. Thanks Susan for making it all happen. Thanks to all of you for your awesome entries. Problem is, where to begin?! Well, the obvious, is to carefully review them all.